Iran began construction of the Uranium Conversion Facility (UCF) at Esfahan in 1999 based on design information provided by China. 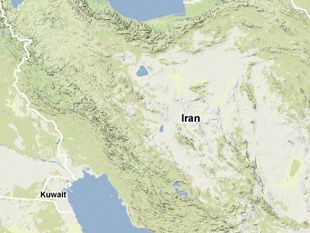 Tehran had received the required documents and training before China cancelled a contract to construct two UCFs in Iran under intense diplomatic pressure from the United States. Construction of the first process line ended in 2004 and production started in 2005. John W. Garver, China and Iran: Ancient Partners in a Post-Imperial World (Seattle: University of Washington Press, 2006), p. 153. Other process lines include the production of UO2 for the IR-40 heavy water reactor at Arak and the production of low enriched UO2 as light-water reactor fuel. For a complete list see: "Implementation of the NPT Safeguards Agreement in the Islamic Republic of Iran," International Atomic Energy Agency (IAEA), 18 February 2010, www.iaea.org. "Implementation of the NPT Safeguards Agreement in the Islamic Republic of Iran," International Atomic Energy Agency (IAEA), 22 May 2013, www.iaea.org. "Nuclear, Iran - Proliferation," Jane's CBRN Assessments, 27 May 2010, www.janes.com. "Implementation of the NPT Safeguards Agreement in the Islamic Republic of Iran," International Atomic Energy Agency (IAEA), 31 May 2010, www.iaea.org. "Implementation of the NPT Safeguards Agreement in the Islamic Republic of Iran," International Atomic Energy Agency (IAEA), 6 September 2010, www.iaea.org; "Implementation of the NPT Safeguards Agreement in the Islamic Republic of Iran," International Atomic Energy Agency (IAEA), 23 November 2010, www.iaea.org. ISIS Imagery Brief, "No Visible Evidence of Explosion at Esfahan Nuclear Site; Adjacent Facility Razed," Institute for Science and International Security, 8 December 2011, www.isisnucleariran.org; Yossi Melman and Reuters, "Report: Explosion rocks Iran city of Isfahan, home to key nuclear facility," Haaretz, 28 November 2011; Hossein Jaseb Tehran and Reuters, "Iranian media contradict each other regarding blast reports," The Globe and Mail, 29 November 2011; Sheera Frenkel, "The secret war on Iran," The Times of London, 1 December 2011.